The Chrestomanci Chronicles is an awesome fantasy series by British writer Diana Wynne Jonnes. I started and finished with Volume I (first two novels) yesterday, and I'm reading Volume II right now! And you know a book has got to be awesome, when Neil Gaiman calls it "...always perfectly magical." If anything big happens in history, like a war or an earthquake; something that might have two or more possible outcomes, reality splits and two or more worlds are created! Presently, there are hundreds of such parallel worlds existing together. Volume I is set in a world pretty much like ours, except that magic is freely practised and it is a bit old fashioned. 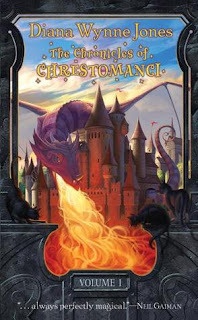 Chrestomanci is the title given to the nine lived magician/ enchanter who controls the magic of all the parallel/related worlds. The first novel is called Charmed Life, and it is about two little siblings, Cat and Gwendolen and the time they spend at the Chrestomanci Castle. Gwendolen is a powerful but stubborn witch, whereas Cat seems to be just a normal boy, who has to suffer because of his sister's ill-doings. Soon she runs to another world, and sends back her counterpart from that world as a replacement - leaving Cat to deal with her mess. While the story is pretty exciting, we get to know little about the Chrestomanci. The next novel makes up for it. The Lives of Christopher Chant is about the little boy who is an enchanter, has nine lives, and can travel to the related worlds in his dreams. And he has no idea what a powerful magician he is! We see him get involved in a gang of wizards who smuggle rare magical materials from the other worlds, befriend a goddess, and eventually, study to grow up and become the next Chrestomanci (the same mysterious man we first see in the Charmed Life). Reading this was almost like Harry Potter all over again. It is funny, the characters are fascinating, the plots are exciting and the imagery is just magical! The stories are full of twists and turns and surprises, and though the book seems a teenie bit childish at times, it is pretty fun! I'd recommend it to anyone in a heartbeat!! I LOVE fantasy. This sounds amazing and the covers are very intriguing as well.